Nancy Krcek Allen's article in the May/June 2009 issue of Vegetarian Times, entitled "Herbal Essences," caught my attention right away. I absolutely love cooking with herbs, experimenting with different combinations, and discovering new pairings. There's just nothin' like cooking with fresh herbs. That's part of the reason I maintain an herb garden. That and herbs are hella easy to grow. Since The Husband and I are on the wane, I selected the recipe that delivered the lowest amount of fat per serving (4g): Apple-Rosemary Oat Bars. Oh man, are these little babies delicious! First, they are not too sweet. I love that. So they can easily be eaten with a cup of coffee or tea for breakfast, as a snack any time of the day, or as a light dessert. Whenever you want, really. Second, the lemon zest and juice really balance out what little sweet there is in the bars, adding a fun little zing to every bite. Third, the rosemary. How I love rosemary! Paired with apple, it's just fantastic. Fourth, the consistency is just perfect. Nice little crunchy bits on the outside and a soft, moist center. The only change I made to the recipe was I substituted spelt whole grain flour for the all-purpose flour. No problem there. The recipe offers several options with regard to nut butters - I used almond butter. Yum! I'm looking forward to working our way through this batch of bars and I think this recipe could serve as a fantastic template to play with and create new herby, fruity bars. The possibilities are vast. i love oat bars! i'm pretty sure i have that recipe too and it looks yummy. yum! i can't wait to try those! i might go for peach basil! Oats are so good. These would be great for an afternoon snack for my kid, uh and me! 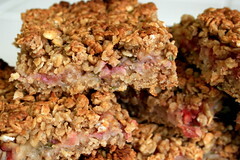 wow almond butter would be fantastic in or slathered on those apple-rosemary oat bars yum! I'm betting the rosemary/apple combo is delish, although I'd not think to combine them. A gardener once told me that lavender substitutes well for rosemary, which makes me wonder about that pairing. Pretty and inspiring, as usual. Your bars look delicious, I'll have to check out this months issue of VT.
i need to make these, Marni - mmmmmmmmmmmmmmm! never would i have thought to try out a recipe with a fruit 'n spice combination - but i'm gonna give it a whirl! i think i'd like to use spelt flour like you did, too! man, these look incredibly awesome! yay!